Our Clamping Kits are among the best in the world! All the blocks, bolts, nuts and hold-downs are case hardened. 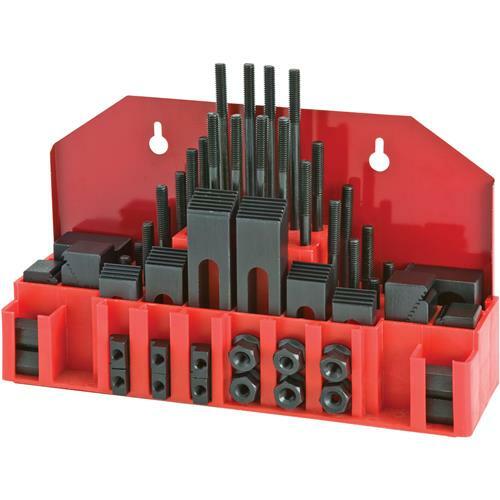 Each clamping kit includes: (24) studs (four studs each: 3", 4", 5", 6", 7", and 8" long), (6) step block pairs, (6) T-nuts, (6) flange nuts, (4) coupling nuts, and (6) end hold-downs. The Model T25250 set fits 3/8" T-slots and includes 5/16"-18 studs. Racks can be bolted to the wall or side of machine for easy access. This works, but it's a little rough around the edges. Be sure to check your T slot dimensions, these fit but they exceed the vertical dimension of the slot so I purchased separate T nuts that fit better. That said I bought these for a vintage mill. I have owned this kit for a couple of months now. The quality is excellent, all nuts and rods thread on smoothly and hold tight when properly secured. It makes quick work of clamping awkward pieces to the table saving me hours of shop building new fixtures for odd jobs. Bought this for new Mill/drill and started using pieces from it before I even got the Mill uncrated. I am sure I will get tired of sharing between machines and already recommended myself get another one. I recently bought this set and am very happy with it. It came in excellent condition and exactly as advertised.